The Silver American Eagle is by far the most popular coin from the United States Mint each year. While the roughly 90 million coins struck in 2014 and 2015 make the Silver American Eagle plentiful, that production applies only to the investment-grade bullion coins. The burnished coin, with a lower mintage and finer finish, is coveted by coin exhibitionists who value visual appeal above all else. Today, the 2007-W Burnished Silver American Eagle coin is available on Silver.com with a unique SP70 grade. Just 8,571 coins earned this condition and grade! Second annual striking of the Burnished Silver American Eagle coin! 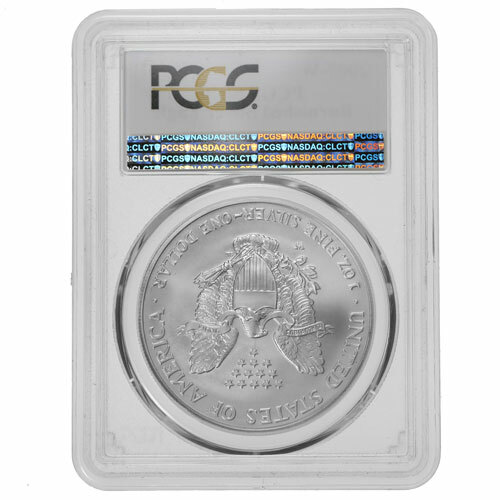 Earned a grade of Specimen Proof 70 from the Professional Coin Grading Service. Features the West Point Mint’s “W” mint mark. Burnished Silver American Eagle coins debuted from the United States Mint in 2006 as part of the 20th anniversary celebration of the coin program. The coins have stuck around since, with burnished versions minted in every year since 2006 with the exception of 2009 and 2010. In recent years, production of the burnished version of the coin has slipped as a result of the immense demand for bullion versions of the coin, as well as the popularity of the proof version of the coin. The mintage of 621,333 burnished Silver American Eagle coins in 2007 was the highest in program history. Burnished coins have a special finish that makes them a coveted item among collectors. Each silver blank is first polished in drum to obtain a unique finish, and then removed one at a time by gloved hands for loading into the coin presses at the US Mint. Each finished coin, after being struck multiple times under immense pressure, is removed by hand. 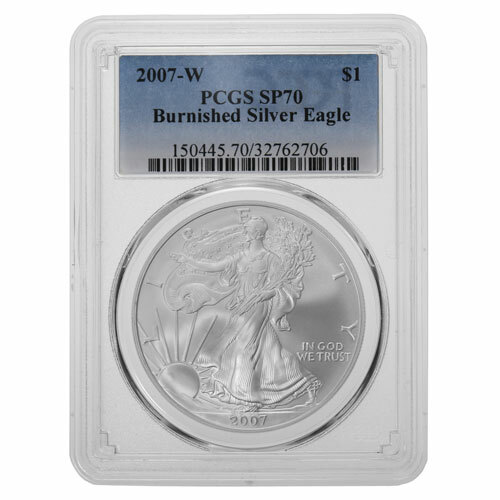 The 2007-W Burnished Silver American Eagle coins in this product listing have SP70 grades from the PCGS. Known as Specimen Proof 70, these are perfect-condition coins with full, original mint luster and no defacing flaws of any kind. SP is a grading term that identifies coins handled individually during the striking process that lack most surface blemishes found on coins handled in bulk. If you have any questions about these unique specimens, please don’t hesitate to ask. A Silver.com associate is available at 888-989-7223, online using our live chat, or via email address.